Toronto-based Mill St. Brewery entered Ottawa almost a year ago with their second brewpub at LeBreton Flats. But, of course, they’re certainly not a new entity. In fact, the brewery celebrates its 10th anniversary this month. In honour of this milestone, we decided to chat with co-founder Steve Abrams to reminisce over the past decade. Here, we present Mill St. Brewery’s timeline, as remembered by Abrams. Mill Street has their unofficial “kickoff”on May 24. Their Organic Lager gets into the LCBO. Later that year they launch their Coffee Porter and Tankhouse Ale. They begin to expand to bars across the city. “People still had no idea who we were, though. They release their first Barley Wine, and Joel Manning joins the company. He is still the brewmaster for the company. 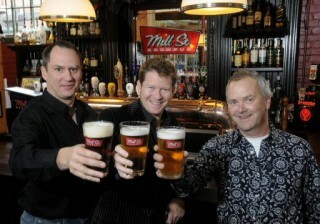 Their first brewpub opens in the Distillery District, and they move production to Scarborough in Toronto’s east end. They still brew at the pub, but on a much smaller scale. They introduce their seasonal six-pack into the LCBO. Their first beer, Organic Lager, gets reintroduced in a can. They open their second brewpub in Ottawa, and then a third one in Terminal One at the Toronto Pearson International Airport. Cobblestone Stout is released in a can.